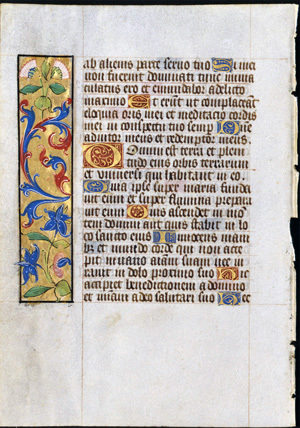 Text: This leaf contains text from the Hours of the Virgin at Matins (here, Psalms 18 and 23). A scan of the recto is not currently available, but it must contain the middle of Psalms 18. Reconstruction Note! In Ege's original manuscript, this leaf followed what is now Leaf 48 in the Ohio State University portfolio. ab alienis parce servo tuo. Si mei non fuerint dominati, tunc immaculatus ero: et emundabor a delicto maximo. Et erunt ut conplaceant eloquia oris mei: et meditatio cordis mei in conspectu tuo semper. Domine adiutor meus: et redemptor meus. Domini est terra, et plenitudo eius: orbis terrarum, et universi qui habitant in eo. Quia ipse super maria fundavit eum: et super flumina praeparavit eum. Quis ascendit in montem Domini: aut quis stabit in loco sancto eius? Innocens manibus, et mundo corde, qui non accepit in vano animam suam: nec iuravit in dolo proximo suo. Hic accipiet benedictionem a Domino: et misericordiam a Deo salutari suo. [from Psalms 18] ...from other men's spare thy servant. If they shall not have dominion over me, then shall I be immaculate: and shall be cleansed from the greatest sin. And the words of my mouth shall be such as may please: and the meditation of my heart always in thy sight. O Lord my helper: and redeemer.